Stampin' Up! Demonstrator Kim Price - Handmade by Kim: New Stampin' Up! Annual Catalogue 2015-16! New Stampin' Up! Annual Catalogue 2015-16! Today Stampin' Up! 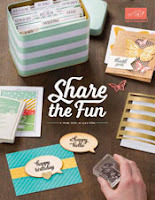 are launching the NEW Stampin' Up! Annual Catalogue for 2015-16. I've already made my wishlist and I will be placing my order later on today....I shall be eagerly waiting for UPS to deliver my order so I can play with the new products!! on. My husband bought me a beautiful watch and some family members contributed to a lovely handbag and matching wallet. Jewellery, handbag and craft supplies..... what more could a girl want? Click on the catalogue above to download and save your own copy to your computer, tablet or mobile phone. Then make yourself a cuppa and take some time out for a browse! If you would like to place an order or you have any questions, please click here to visit my online shop or click here to contact me by email. If you missed last weeks Pinkies Blog Hop, click here to view my project then scroll down and click NEXT to view the next blog and so on.